Glee paid tribute to Fleetwood Mac's "Rumours" this week and it was the truth. The only cheese in this week's episode "Rumours" was in Brittany's fondue pot. Brittany and Lord Tubbington were a great kick off to the episode. Did anyone notice the photos on the wall behind her though? They didn't look like they were shots of her or were they? Maybe I was the stupid one Artie, either way Brittany was completely dope all episode long. Sue did seem a bit unhinged but she did paranoid well and made for a hilarious Ann Coulter. April was good in her return even if she looked a little like Magda from There's Something About Mary as she sipped her drink in Sue's office. Loved her line about drinking her dinner these days while having the straw in the wine glass to boot. The woman can sing that is for certain. Anyone else catch her sneaking a peak at Will's rear end after the performance of "Dreams?" I felt bad for Artie, but after he called Britt "stupid" I knew it was time for "Brintana" to emerge. Artie really belted out that "been down one time, been down two times" line from "Never Going Back Again." I bet people would pay a lot of money to have Puck just follow them around with his guitar. In the end, Artie will be ok. There are new levels for Angry Birds Rio due out this month. 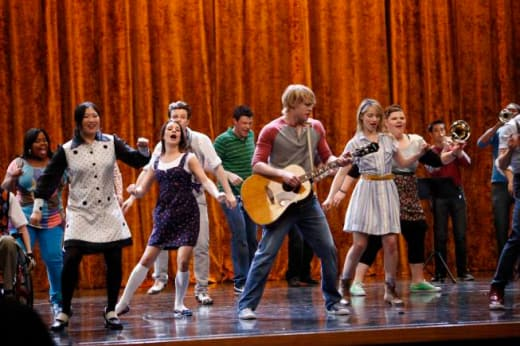 Speaking of birds, Santana soared as she sang "Songbird" for Brittany. After that performance I think I love her "like never before", but I really wanted her to tell the others because they would have seen it in her eyes that it's right and the songbirds would sing as if they knew the score. Emma looked great, maybe the best she ever has. Keep up with the meds Ginger and remember the words of Lloyd Christmas, "pills are good, pills are good!" 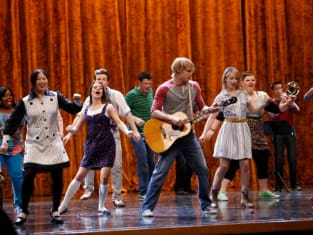 With Puck on guitar, Finn on drums and her with her bedazzled microphone, Rachel's version of "Go Your Own Way" was pure fire and vintage Glee! I've always loved when the other group members join in and sing along on the choruses. It's just a sign of how much they all love classic music and while I have liked the contemporary stuff this throw back tribute was really something special and long over due. Touching stuff with Sam and his family. Didn't feel too bad for his little brother though as he got to dance with Quinn, lucky little bugger. All in all it was a nice follow up to such a hyped episode last week. With a number of big questions still looming I'm very much looking forward to Prom and to all your comments. Don't forget to check out our Glee quotes section from this week, I'm gonna go see if I can still squeeze into my old tuxedo. Santana told me never to speak alone with you because you would try to steal all of my gold. Lord Tubbington is allowed to eat cheese because he's on Atkins. Permalink: Lord Tubbington is allowed to eat cheese because he's on Atkins.